Tune ups are the best way to keep your car in good shape. When it is running at its best, you get better performance and better gas mileage while also increasing longevity. Art Morse Auto Repair hand-picks its master ASE certified technicians for their ability to work on any make, model, or age of vehicle. Tune up service applies to the latest model vehicles to the oldest cars on the road. We are happy to track the manufacturer’s suggested maintenance and replacements for you so you can keep up on maintenance before worn parts have a chance to cause a breakdown. Cars have several parts that break down over time and are meant to be replaced regularly, depending on how long you keep your vehicle. Additionally, if you just purchased a used vehicle, it’s always a good idea to bring it in for a tune up before putting too many miles on it. It can be hard to know when you should replace a part or need other maintenance items preformed for your specific vehicle type. Each manufacturer has different recommendations for each year and type of auto they make. Typically, manufacturers recommend 30k, 60k, 90k, and 120k mile tuneup services. As an independent auto repair shop, we have that information available on all makes and models. Let us keep your car current so you don’t have to worry about it. We keep a large stock of high-quality parts available so we are ready to change out the worn out ones in your car before they have a chance to give out. No waiting! 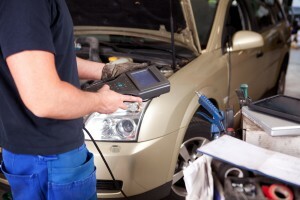 Our shop is fitted with the latest high-tech equipment for diagnostics and testing. When you come to us for your tune ups, you get a thorough inspection! We speak with you about what we find prior to making any engine repairs or replacements and our friendly staff are happy to take the time to answer any of your questions or concerns. Qualified parts and labor are backed by our 2-year/20,000 mile warranty, so you can feel confident in the work we do. Also, ask us about our fuel and intake system cleaning! Call today and stay on top of your car’s tune ups in Battle Ground.